« Fat Cat Liar by Ahren Sanders Blog Tour with Excerpt! The Rush Series duet is now complete, and the writing duo of Vi Keeland and Penelope Ward did the impossible–they got a devout cliffhanger-avoiding reader like me to actually enjoy the whole cliffhanger experience. Starting a book knowing it would end in one, reading that first story, waiting for it happen—the gasp of surprise at the moment when the first book ends. The wait for the second book and the almost overwhelming excitement when I finally started reading it. I honestly found myself enjoying an added level of excitement around the releases of these books that I don’t typically experience. 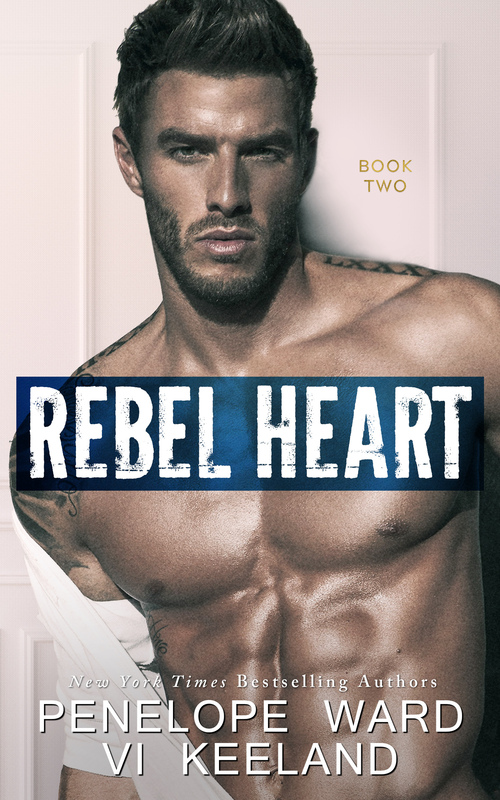 Don’t get me wrong, if Rebel Heart had been available to me immediately upon finishing Rebel Heir, my need for instant gratification would have kicked in, and I’d have read it. But since that wasn’t an option, I let it go, and in doing so, I felt the simple pleasure of looking forward to Rebel Heart and actually enjoyed that build-up. Go figure. I spent a lot of time over the month between the two books thinking about Rebel Heart, and I still wasn’t prepared for powerful punch of angsty emotion and soul-deep love Vi and Penelope delivered here. Readers were left hanging at the end of Rebel Heir on the cusp of what promised to be a dramatic show down. My gut twisted in anticipation of this moment, and I was not disappointed—I was devastated. Gia and Rush were a fantastic couple, and I bought into their love story early into Rebel Heir. The emotion in this book was so thick—I felt every bit of Rush’s rage and Gia’s frustration. The fall-out from this turn of events was heartbreaking, and I was as crushed by them as this couple was. Rush’s misery and indecision were difficult to experience, and Gia’s anguish left me as distraught as she was. But the love they shared was so deep and real, they couldn’t even hate each other. Oh no, that love was still very much there, but like the two of them, I wondered if they could find their way back to it. One of the things that I loved about this book was the fact that the side characters play larger roles. Whether they were supporting Rush and Gia during this difficult time or plotting their demise, I loved seeing those character interactions playing out on the page and the richness those scenes brought in terms of the plot’s development. Let me just say this about the villains in this story: they were foul, absolutely nastiness personified, and on more than one occasion, they made my skin crawl. Keeland and Ward gave their readers an incredible story full of aching, soul-deep love mingled with hefty doses of pain and betrayal in the Rush Series, and Rebel Heart was a fantastically executed, emotional and passionate conclusion to it. Gripping and riveting, in that cannot-put-it-down kind of way, Gia and Rush’s love story journeyed through all of my emotions, and I loved every single word of it. Five smooches from me for Rebel Heart by Vi Keeland and Penelope Ward!